In the original Sonic games, uneven bumps frequently occur in the terrain. These bumps allow for authenticity and variety. The bumps made it easier for players to engage with the speed. 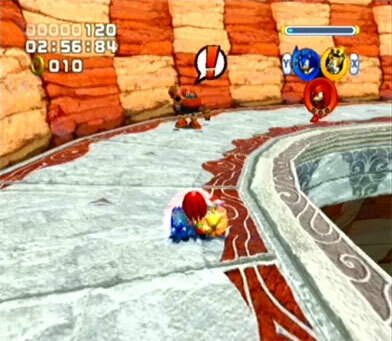 The bumps cause Sonic to move up-and-down as he crosses the surface. The movement is only minimal, but it creates the effect that Sonic’s feet are reacting to the terrain. This makes the experience feel more authentic, as, when walking in real life, people can feel subtle variations on the surface of the ground. Modern Sonic games lack uneven surfaces. Although curved paths, corkscrew strips and other such speed devices are frequently used, the roads that make up these devices are completely smooth. Sonic often feels to be floating across the ground. This makes the experience less engaging as it feels artificial. In the original Sonic games, running over uneven surfaces also affects the acceleration as it causes the player to quickly shift between slow-and-fast, which creates a jolt of speed. These jolts are pleasurable, as they generate sudden thrills and add variety to the experience of moving fast. As the uneven surfaces are missing in the newer games, the jolts are mostly absent. This will add variety and increase the , making it easier for the player to engage with the speed.